Accessible Luminous flux and radiant power measurement of LED lamps and modules. The Opti Sphere 500 was designed specifically for growing lighting companies in the booming LED retrofit business that need a quick and reliable solution to test & measure medium sized lamps and LED modules. It offers an excellent choice for any LED luminaire manufacturer interested in characterizing the quality of their product. 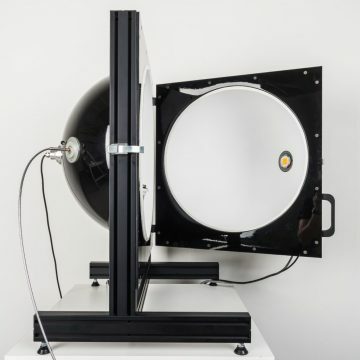 This 50cm integrating sphere generates immediate measurements of luminous flux, color temperature, luminous efficacy and many other important light characteristics. With its small dimensions, the Opti Sphere 500 is a perfect table top instrument providing laboratory accuracy, without the need for a dedicated laboratory or highly skilled technician. This calibrated system is conforming to CIE global standards and all American and European requirements for professional LED light measurement instrumentation. 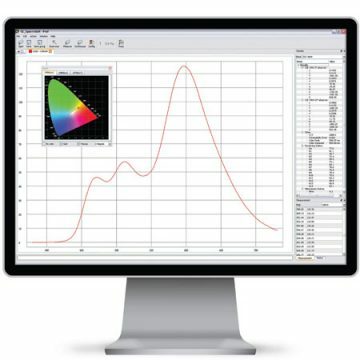 Choose between any of our spectrometer options to create a high performance, easy to use Sphere Spectroradiomemter setup. By default this sphere is equipped with the most popular lamp holders. The standard lamp post installed in the center of the sphere makes it easy to install different products and perform professional light measurements. An optional mechanical breadboard can be supplied to allow for easy installation of different LED lighting fixtures or small luminaire. This instrument can be easily installed in a standard office space allowing R&D departments and engineers quickly and accurately measure lighting components onsite. Sending lamps and components for testing in the lab means long lead times and ultimately slows down the development cycle. Now, when new LEDs are delivered or a new board is fabricated they can see results immediately. This flexible integrating sphere system can easily be adopted to specific customer’s needs and turned into a production tester or a quick production control unit which will help to measure lamps, luminaires and modules as they are manufactured. Larger distribution companies use this for quality compliance testing of purchased products before they are released to the market. The rapidly expanding LED retrofit lamp market demands quick & reliable solutions to test & measure small to medium-sized LED products. 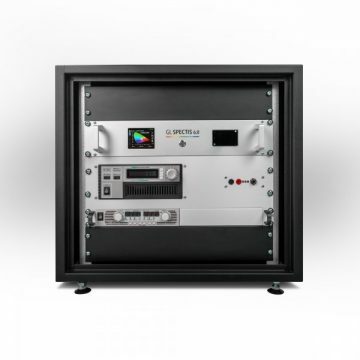 The Opti Sphere 500 integrating sphere was produced to meet this need and delivers complete optical measurement of LED retrofit / replacement lamps with typical sockets like E27, E14 GU10 and others. As we rolled out the solution, it quickly became evident that this compact benchtop instrument is equally suited for use in a lighting laboratory as well as in R&D departments for immediate evaluation of components, prototypes and final products. 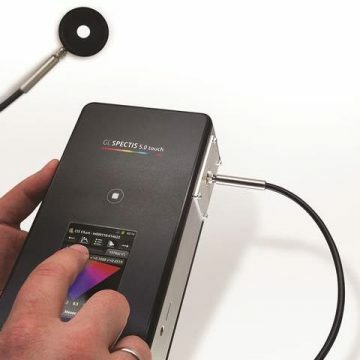 The Opti Sphere 500 lowers the barrier of entry for professional light measurement. A dedicated metrologist or large dark lab are not required. Setup the system and start understanding your lamps in no time. The setup and operation ensure engineering staff generate accurate results even with only limited test experience. Our customers appreciate that you can just open the sphere, install the lamp inside and measure. This sphere is equipped with all accessories and components you need and our GL Spectrosoft software interface will help you to do it right. Need to make a lot of different measurements and don’t have the budget or space for a large sphere? The Opti Sphere 500 offers an excellent entry into the laboratory test & measurement space for LED modules, lamps and components that you use in lamp manufacturing. This integrating sphere can be combined with any of our spectrometers for accurate flux and color testing. Now you will be able to check components, diffusers, control the influence of new electronic drivers and produce reports immediately and frequently. Get photometric results for prototypes, verify the LEDs and components from your suppliers and get your light quality under control! All GL Optic spheres are delivered spectrally calibrated when purchased with the measurement instrument. Our spheres are universal and can be used with any GL Optic spectrometer. The inner walls of the sphere are coated with barium sulfate (BaSO4) which ensures high reflectance properties up to 97%. Use the standard Opti Sphere 500 system with universal lamp post for optional mechanical breadboard for 4pi measurements of small lamps and modules. All spheres also include a side port for accurate measurement of 2pi sources. Additional adapters, mounts for temperature control or specialized holders are also available on demand. Please contact us to share your requirements.